The fifth annual Lincoln Highway BUY-WAY Yard Sale is being planned for August 6, 7, and 8, 2009. Sales will stretch from Chester, West Virginia, across the Ohio River through Ohio and on into Indiana and Illinois. Ohio, the originator and most active promoter, announced that although the “Lincoln Highway Historic Byway” designated by ODOT is the 1928 route across the state, there are several earlier alignments that will also have sales and will celebrate the history of the road, almost doubling the 241 miles of sales across the state. Last year there were an estimated 750 sales. 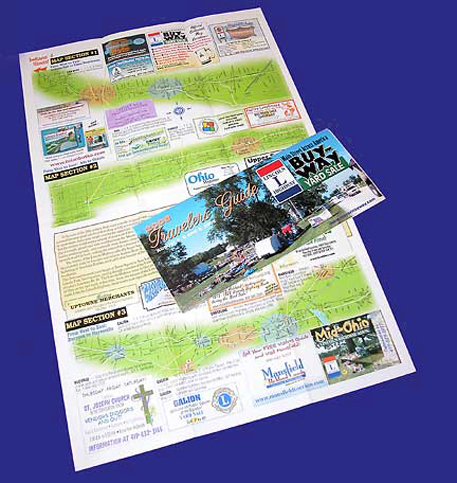 For the past two years, a Travelers Guide with maps and info on sales and activities has been distributed free along the corridor. Executive Director Mike Hocker encourages churches, restaurants, or any organization to participate and take an ad. 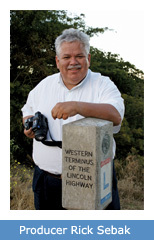 Call him at (419) 468-6773 for details before May 15 or visit http://www.historicbyway.com/. 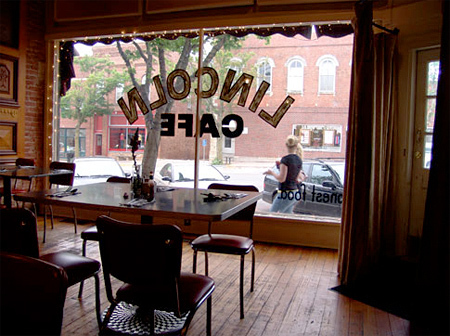 Sunday’s Cedar Rapids Gazette ran a story about the Lincoln Cafe, along the Lincoln Highway in Mount Vernon, Iowa. Owner and chef Matt Steigerwald won the Cochon 555 competition held in Des Moines on April 19. Below is the story and a photo of the place by PBS producer Rick Sebak. Cochon is French for pig, so 5 competing chefs prepared a Heritage Pig for judging and public tasting. Steigerwald was the only chef not from Des Moines. The chefs prepared the pigs in their own restaurants and transported them to the competition—for Steigerwald, a 2-hour drive. Some of the items Steigerwald made were pozole (a Mexican soup made with pork and hominy), a pork belly confit, biscuits made with lard, head cheese and Carolina pork barbecue. Steigerwald took home a bottle of Templeton Rye and a trophy that declared him the “Prince of Porc.” The competition is traveling nationally and will be in Chicago next on May 24. For more information go to www.amusecochon.com/. By now, you’ve read here about the recreation of Alice Ramsey’s pioneering drive in 1909, making her the first woman to drive across the U.S. 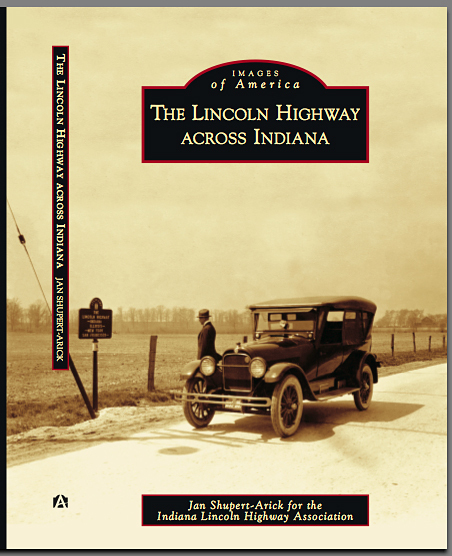 Most of her route west of Ligonier, Indiana, would become the Lincoln Highway four years later. 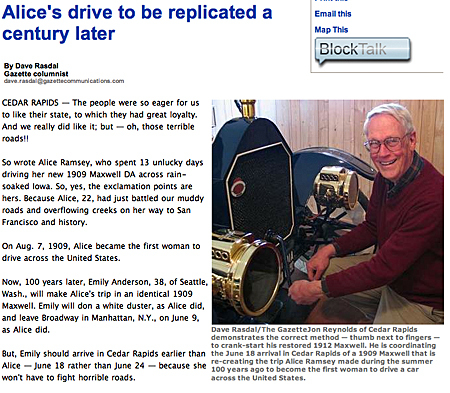 This summer, Emily Anderson, 38, of Seattle, will retrace Alice’s trip in an identical 1909 Maxwell, thanks to her father Richard’s expert efforts to create one from parts. 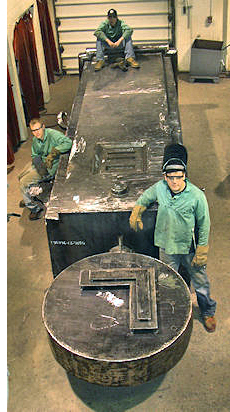 The Cedar Rapids Gazette has a nice article about local efforts to welcome the Maxwell when it arrives there June 18, 2009. The writer gives a nod to Gregory Franzwa’s reprinting of Alice’s memoir of the trip. The trip launches June 9 from Broadway in New York City. Read more at aliceramsey.org including how they’re test driving it for 1,000 miles before the big trip. Allen County Public Library (Fort Wayne), Sunday April 26, 2 p.m. 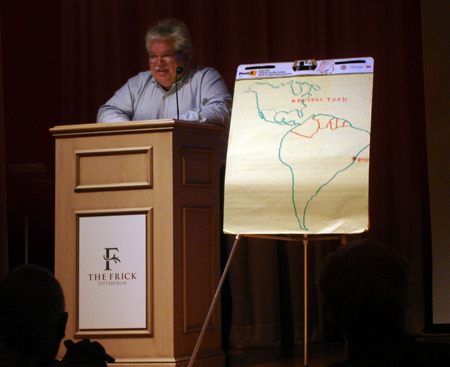 The History Center (Fort Wayne), Saturday May 9, 2 p.m.
For more information, call (260) 471-5670. Jan is a native of northern Indiana and her family has roots in the state’s automotive history. 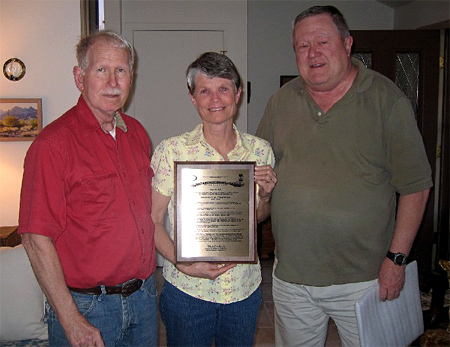 She is a past president of the Lincoln Highway Association and past director of the Indiana Lincoln Highway Association. 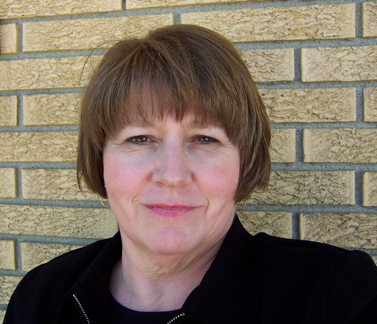 She serves on the northern Regional Council for Historic Landmarks Foundation of Indiana. Her book covers both the original route across northern Indiana and the 1926 mid-state realignment. A number of Model Ts were on display and can be seen through Sunday May 3 as part of A Revolution on Wheels: The Model T at 100. The Frick has borrowed four vintage autos to supplement the 1914 Model T Touring car already in its collection: a 1909 Model T Touring Car, a 1917 Model T Runabout, a 1925 Model T Depot Hack, and a 1926 Model T Coupe. 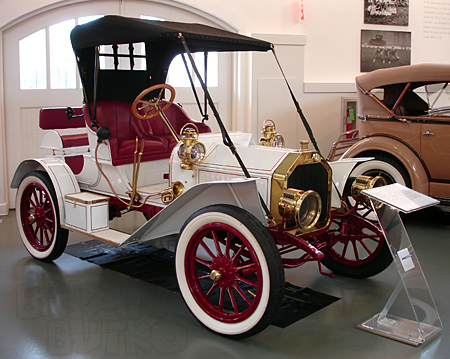 Visit the Frick’s Car & Carriage Museum at 7227 Reynolds St., Point Breeze, www.frickart.org, (412) 371-0600. 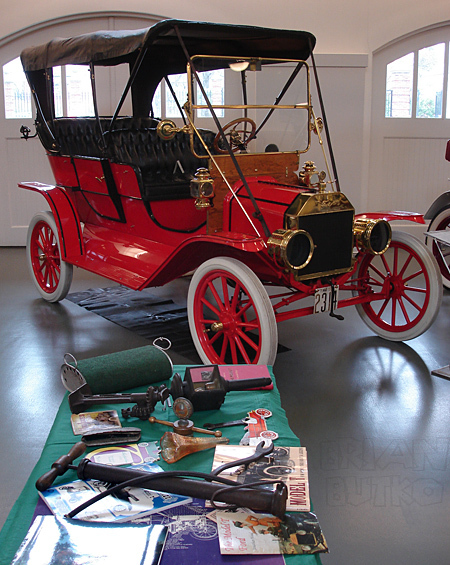 The Car and Carriage Museum at the Frick Art & Historical Center is hosting a weekend-long Model T Jubilee. The celebration and activities on Saturday and Sunday celebrate the exhibit “A Revolution on Wheels: The Model T at 100,” which opened in October to commemorate the 100th anniversary of the 1908 Model T. The exhibit, which contains five Model T Fords ranging from 1909 to 1926, will close on May 3. 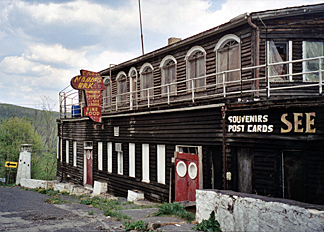 The museum is along the Lincoln Highway in the Point Breeze section of Pittsburgh, Pa. 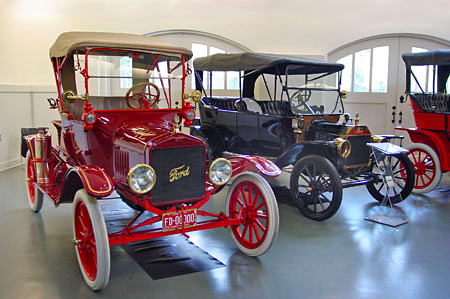 ABOVE: Model T Fords at the Frick’s Car and Carriage Museum. Photo by Pytlik Design Associates. 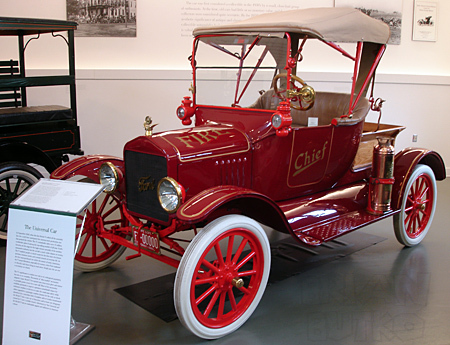 The Model T Jubilee is free; Sebak’s talk is $10, $8 for members. The Frick is at 7227 Reynolds St., Point Breeze, www.frickart.org, (412) 371-0600. 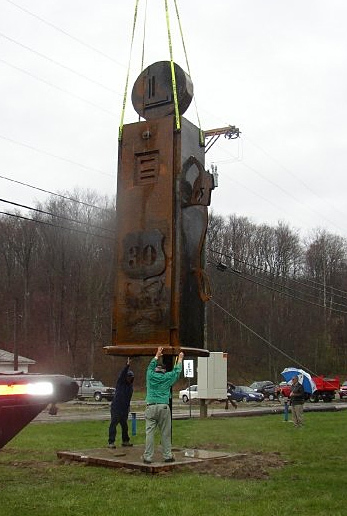 The Lincoln Highway Heritage Corridor has announced that the first of the Roadside Giants student sculptures has been installed along the Lincoln Highway west of Ligonier, Pennsylvania. 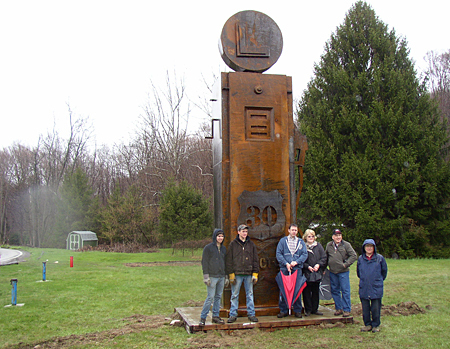 The Roadside Giants program encourages students from vocational and technical schools along the Lincoln Highway (US 30 in PA) to design and create sculptures that will line the road. They are named for the larger-than-life buildings and statues that are used to attract travelers to stop and spend some time and money, documented in such esteemed books as Roadside Giants — yes, written by me and my wife Sarah. The first Giant, from the Eastern Westmoreland Career & Technology Center, is a replica 1940s Bennett Gas Pump at the future site of the Lincoln Highway Experience, a welcome center and attraction in Ligonier Township. It’s at the intersection of US 30W and Route 259, near the Idlewild Park entrance. Ligonier Living also wrote a story about it. • Franklin County Career & Technology Center built a replica 1921 Selden Apple Truck like the ones used to haul produce at Chambersburg’s orchards. • Central Westmoreland Career & Technology Center wanted to design a Lincoln Highway-era figure, so they chose a Packard Car with Driver. The Veterans Memorial Bridge linking Columbia with Wrightsville, Pennsylvania, may soon be getting a facelift. 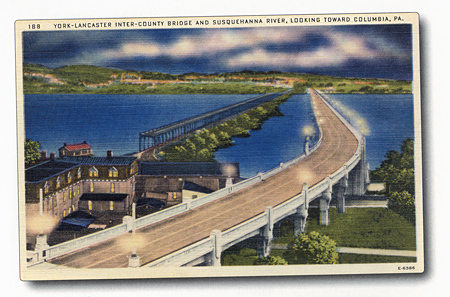 The Lancaster Intelligencer Journal reports that on April 30, 3 pm, at the Columbia Borough building, the nonprofit Lancaster-York Heritage Region will unveil plans for the renovation of the bridge and ask for public input. Plans call for a three-phase project. In the first phase, workers would replace the “cobra” streetlights put in during the 1970s with reproductions of the original art deco lights used when the bridge first opened to traffic in September 1930…. The second phase would concentrate on the “travel plazas” at either end of the bridge, including upgrades such as new landscaping and pedestrian improvements such as traffic islands or “roundabouts” like those found in Gettysburg and Abbotstown. The project’s final phase would involve “under-lighting” the bridge’s reinforced concrete arches. “This last phase would be aimed at travelers going across the nearby Route 30 bridge,” Pinkerton said. I am also quoted in the article, in varying degrees of accuracy.